Horse Life is one of the best DS horse games I have played. The graphics are wicked awesome! i would suggest this game to anyone. You can choose between three real horse breeds and an unicorn. You can also choose cool stuff like what marking your horse will have. At the beginning, after you choose your horse and name it, you see it as a baby. There are multiple levels in which you can unlock prizes. I highly recommend this game!!! Where can I download horse life 2 for pc? Someone please help! Ok, I can't get this game on DS or WII so I need help. How do I get it on computer?! Please help me! I love horses so much so please tell me how to get the game. I got it but it's only demo, how do I get the full game? I have the game on pc. how do I jump? please, someone answer. How do you get a cross country diploma? i love this game and have it on my wii but want a cross country diploma, how do you get one? i have it and it's beautiful!!!!! Yes. I have it and i have three horses: 2 arabian, 1 black and 1 white and one english brown. I have unlock all prizes!!!!! hi I have horse life 2 on PC, I don't know how to jump my horse when I get close to a jump? what buttons do i press? is it keyboard or mouse? i've got it for ds, it's a nice but easy game. Love this game, a bit complicated to control at first but fun and easy once you get into it! So excited till my birthday!! My mom is going to get me a horse game for my birthday, i am not sure if it will be this one but i hope it will. because i love horses so much i'm giving this page 5 stars. I have been looking at this game but since I don't have a ds or wii I will have to get it on pc. A question: how do you control the horse on pc, with the mouse or keyboard. Also how do you jump? Thank you in advance. This game is really good and realistic. The only thing is that the commands to make you're horse jump and turn are quite hard to get right. This is still a really good game. I would recommend to any horse lover! is horse life 3 in windows pc version as well? There is also a horse life 3. There you can have 7 or 8 horses at one time. you can also breed with them and there is much more track than in horse life 1 and 2. I think horse life 3 is the best nds horse game. You can choose a breed of your own and watch your beautiful foal be born. Three years later it's ready to ride and can go in many exciting competitions. I can't get me horse to jump on hacks or training. I am playing horse life on the Wii. Please help! in the game or at your house? do you mean on your game or do you have real horses? if you do you are so lucky!! :)well anyway i really want to get horse life 2 do you have it? i have three horses called prince, carman and one foal called heaakbinnfdoc. I have both series in the Horse Life games and they are both excellent. I highly suggest that you should buy this game. Horse Life Adventures 1 was outstanding.... and this one is even better! 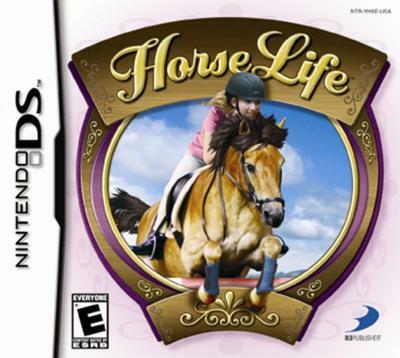 you should also try another horse game..
is Ellen Whitaker's Horse Life game the very same as Horse Life 2? Just wondering, i live in the US, in Arkansas, and I have been looking for Horse Life 2 but can't find it anywhere.. now i can't even find the pc version of Ellen Whitaker's Horse Life!!! Is it even available yet? Will do you know that game instead of that game? Mum said that she would get me Ellen whitiker's horse life for my birthday. i cant find horse life 2 pc game!!! i can't find the horse life 2 PC game i want it sooo bad.. does your horse appear as a baby in horse life 2 as well, or just in horse life? there are so many versions of the game:horse life, horse life 2, horse life adventures, elln whitakers horselife, i think there is even a horse life 3!!! i really want horse life 2 cuz i hear it has the best graphics and all that but the only place i found it was in amazon french and i can't understand what the words say and i don't want to get it if the words are french on the game can anyone plz help me??!! please answer soon!!! hi guys i have ordered this game it should be coming soon. i have seen the trailers on YouTube this game is gonna be so much fun. i will post as soon as it comes and i will tell you how fantastic, so what can you do on horselife cause i heard you can do riding and shows, so what can you do? somebody please reply i am so looking forward to playing horselife. a similar game is called Horse Life Adventures!!!!!!!!! WEIRD! I got the exact same game for Christmas but it was called Horse Life Adventures instead. Do they sell it under a different name here in the US. OMG I love this game! Definitely recommend it 2 u, its awesome! I'm looking for an awesome horse game, but, I'm real fussy about the graphics. Does the horse look totally real and can you ride western in the game? I totally love this game, it is like the best game in the whole galaxy and I recommend you should buy it. I would change that you could have a dell as your chose of horse. I like it because you get to ride in Africa and Europe - well, I did. can you play some mini-games on this d.s. game?